Here’s a great idea if you have on old television that you don’t want to throw in the rubbish. Turn it into an aquarium! 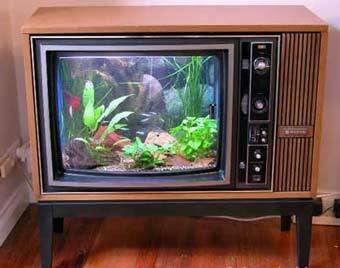 The chap who came up with the TV fish tank hack has spent 15 years caring for fish, so it must be viable as an aquarium. He did lose a couple of fish though, two for unknown reasons and one managed to leap out, but I think that’s standard in any aquatic collection. A few things come to mind though. Firstly when stripping down the old television, it’s possible that if the television has been used recently that some of the components inside have some residual charge, which can be anything up to around 20,000 volts. So don’t try this unless you are an experienced technician and know what you are doing. The second thing is the weight of the tank. It’s possible that for a larger television that the weight of the fish tank and accessories can exceed the original design specifications for the cabinet and it’s supporting legs. If you’re not put off by these minor details – then go for it and be sure to send us a picture! Details of the television fish tank mod can be found Aquahobby. Plasma Candy also makes an – which lets you turn your TV into an aquarium for a few hours. If you want a TV Aquarium with a large front wall, perhaps you can reduce the weight significantly by using a tank with a lesser width on its other sides, and using a background picture on the rear wall to make it look more full if the water does not go to the top. Also, you could build a terrarium for lizards or spiders etc, that would weigh much less. god, early ww2 british tank ofefcirs were DUMB. HEAT rounds would have made a HUGE difference I love that scene at 5:34. Maybach hl230 (?) crank shaft one of hte few with that weight arragnement.